To Cite: Ashrafi Hafez A, Ahmadi Vasmehjani A, Baharlou R, Mousavi Nasab S D, Davami M H, et al. Analytical Assessment of Interleukin - 23 and -27 Cytokines in Healthy People and Patients With Hepatitis C Virus Infection (Genotypes 1 and 3a), Hepat Mon. 2014 ; 14(9):e21000. doi: 10.5812/hepatmon.21000. Background: The immune system plays important roles in determining the outcomes of hepatitis C virus (HCV) infection. Interleukin-23 and -27 (IL-23 and IL-27) are two novel IL-12 cytokine family members known to enhance the T-lymphocyte response, but their precise involvement in HCV infection is not well known. Objectives: We investigated the serum IL-27 and IL-23 levels in patients with HCV infection and in healthy individuals. Patients and Methods: In this case-control study, we assessed IL-23 and IL-27 levels in serum of 37 healthy individuals and 64 patients with chronic HCV using Enzyme-linked immunosorbent assay (ELISA). The relationship of cytokines level with liver enzymes (ALT, AST, and ALP), HCV genotype and viral load were analyzed. The differences of these cytokine levels in the groups of treatment and no treatment was compared. HCV genotypes were classified by HCV-specific primers methods. HCV RNA loads were determined by fluorescence quantitative PCR. Conclusions: These findings may reflect a vigorous pro-inflammatory reaction orchestrated by the host immune system against chronic HCV. Also, a better understanding of the involvement mechanism considering the correlation between other genotypes with inflammatory cytokines in various stages of disease can be obtained. Hepatitis C virus (HCV) is a positive-strand RNA virus that has infected about 3 % of the world population. According to World Health Organization (WHO) estimates, three to four million new HCV infections occur every year. Approximately 80% of patients with acute HCV fail to eliminate the virus and become chronically infected (1). Although liver failure is as result of HCV infection, it does not directly cause cytopathic effects and pathogenic mechanisms responsible for infection outcome are poorly understood. Modulation of specific humoral and cellular immune responses may be crucial in the prevention of disease progression that leading to a recovery in liver damage severity (2). Cytokines are the main biological mediators, with a broad range of physiological functions that produced by a large variety of cells at different stages of liver disease (3, 4). As the roles of cytokines in the immunity modulation, pathogenesis and eradication of chronic HCV has become obvious, and the necessity of focus on this antiviral has also proposed (4). Because different HCV genotypes have various susceptibilities to interferon (IFN)-based therapies, therefore recently the survey of cytokines in HCV infection has been considered in various genotypes. In previous studies, the roles of the pro-inflammatory cytokines such as IL-1, IL-6, IL-18 and TNF-α in liver chronic disease progression causing to HCV is determined (5, 6). It is shown that interleukin-12 families, such as IL-23 and IL-27, which are mainly produced by antigen presenting cells as macrophage and dendritic cells, play a critical role against intracellular pathogens, especially viruses (7, 8). Clearance of HCV is associated with vigorous and robust innate and cellular-mediated immunity response- CD4 + and CD8 + T cells (9, 10). Recent studies showed that IL-23 and IL-27 cytokines have different immunological properties. IL-23 is composed of the IL-23 specific p19 subunit and the IL-12p40 family (9). Similar to IL-27, IL-23 preferentially induces memory CD4 + T cells proliferation (11), and also stimulates CD8 + T cells to Cytotoxic T lymphocyte (CTL) differentiation that plays a significant role in spontaneous clearance of HCV (9). Previous studies showed that serum level of IL-23 is increased in chronic hepatitis C (CHC) that noted pattern can be seen in HCV genotype 4 (12). It seems IL-27 has attenuator potential in immune/inflammatory responses and also can induce anti-inflammatory states against Th1-type immune responses. In addition, IL-27 exerts immune-suppressive functions by Th2 and Th17 inhibition (13) (14) that maybe mediated by the production of IL-10 from T lymphocytes (15). Some results showed IL-27 can inhibit human immunodeficiency virus 1 (HIV-1) (16) and HCV replication in vitro (17) and increased in hepatitis B (HBV) infection has been seen both in vivo and in vitro (18). According to previous studies, it seems IL-27 and IL-23 levels varied in various HCV genotypes. However, there is a cleft on the rate of the IL-27 and IL-23 level in various HCV genotypes and different stages of disease. Therefore, in the present study, the serum concentration of IL-27 and IL-23 in patients with different stages of HCV infection based on various genotypes was examined. In addition, it is assessed the relationship between cytokine serum levels and the patients’ clinical or pathological status. Prior to study initiation, written informed consent forms, compiled by the Ethics Committee of Jahrom University of Medical Sciences were signed by the patients. At the end, 64 patients with HCV-related liver disease were included in the study. Chronic HCV was diagnosed by elevated serum transaminase levels for at least six months and consistently detectable serum HCV RNA. All patients were anti-HCV positive and were negative for serological markers for all other hepatotropic viruses as HBV surface antigen (HBs Ag) and Anti HIV-1 and HIV-2. The diagnosis of HCV infection was defined by detection of anti-HCV antibodies (DiaPro, Diagnostic Bioprobes srl, Milano, Italy) and usual liver enzymes, Alanine Aminotransferase (ALT), Aspartate Aminotransferase (AST) and Alkaline Phosphatase (ALP) data. Patients were divided into two groups based on drug therapy. Also, blood samples from 37 healthy individuals without history of liver disease were also obtained as control group. Co-infection with HBV, HIV and the presence of liver diseases were used as exclusion criteria. RNA virus was extracted from patient samples using the AccuPrep Viral RNA Extraction Kit (Bioneer, South Korea). Isolated RNA was converted to cDNA using 1 μL random hexamer (Fermentas GmbH, Germany), 6.5 μL nuclease free- water, 4 μL buffer 5x, 2 μL dNTPs (Fermentas GmbH, Germany), 0.5 μL and 1.5 μL Maloney Murine Leukemia Virus Reverse Transcriptase enzymes (Fermentas GmbH, Germany), then transport at 65 °C for five minutes, 25 °C for 10 minutes, 42 °C for 60 minutes and 70 °C for 10 minutes. For genotyping, HCV type-specific primers designed by Okamoto et al. were used. The PCR program was set for one cycle at 96 °C for six minutes, then for 40 cycles at 95 °C for 1 minute, 60 °C for one minute, and 72 °C for one minute, and a final extension cycle of 72 °C for 10 minutes. Quantitative reverse transcription polymerase chain reaction (QRT-PCR) for HCV was done using TaqMan technology according to Rosch HCV RT-PCR assay. Probe signals were detected in real-time (7500 Real time PCR system; Applied Bio Systems). Typically, the lower limit of detection for this assay is 1000 IU/mL. All analyses utilized SPSS for Windows version 16.0 (SPSS, Chicago, IL, United States). The mean ± SD were determined, a T-test for comparison of means of different parameters was used. Analysis of variance was employed for comparisons of means of the different parameters, with Tukey-Kramer test as the post hoc test and ANOVA test. Proportion analysis was performed using Fisher’s exact test, and the correlation between two categorical groups was analyzed using the Pearson test. A p-value of less than 0.05 was considered statistically significant. In this study, we included 64 patients with chronic HCV (47 untreated and 17 treated patients; 39 men and 25 women, with a mean age of 41.6 ± 11.2 years, ranging between21 to 68 years). Table 1 demonstrates the distribution of patients and controls regarding different clinical and laboratory parameters criteria. Frequency of 3a and 1a Genotypes in chronic HCV patients was 44 (43.6%) and 20 (19.8%) respectively. Liver markers as ALT and ALP in chronic HCV patients (untreated and treated) groups were significantly higher than control group (P = 0.001 and 0.03, respectively). Although comparison of both them showed less level in untreated chronic hepatitis C than in treated patients, difference was not statistically significant (P = 0.07). There was significant difference in IL-23 level between three groups (untreated HCV-infected, treated HCV-infected patients and normal controls) (P = 0.018). It was shown that serum level of IL-23 among patients was significantly high compared to control group (24.6 ± 8.4 vs. 20.2 ± 5.3 pg/mL; P = 0.005) (Figure 1). Serum level of IL-23 in untreated patients did not differ compared to the untreated patients (24.9 ± 8.6 vs. 23.8 ± 7.7 pg/mL; P = 0.84). Unlike IL-23, there was no significant difference in IL-27 serum level between patients compared to the control group (378.2 ± 36.3 vs. 381.8 ± 44.5 pg/mL; P = 0.65). Also, IL-27 levels was not statistically significant among our three groups (P = 0.89). Furthermore, the noted serum level was not significantly different between the untreated- and treated- patients, comparing to controls (378.7 ± 38.2 vs. 376.7 ± 31.5 pg/mL; P = 0.98) (Figure 1). Figure 1. Serum level of IL-23 and IL-27 in the peripheral blood of HCV-infected patients and normal controls Presented data were analyzed with the t-test and the horizontal lines are showing the IL-23 and IL-27 mean levels of figure 1 Serum level of IL-23 and IL-27 in the peripheral blood of HCV-infected patients and normal controls Presented data were analyzed with the t-test and the horizontal lines are showing the IL-23 and IL-27 mean levels of the groups. (a) Significant difference was found in the serum level of IL-23 in peripheral blood of all HCV-infected and untreated patients compared to healthy controls (P = 0.005 and 0.005, respectively). However, there was no significant difference between untreated HCV-infected and treated HCV-infected patients and also between control group compared to treated patients (P > 0.05). (b) There was no significant difference in IL-27 serum level between 4 groups (P > 0.05). Figure 2. IL-23 and IL-27 serum levels in peripheral blood of treated and untreated patients based genotype 1 and genotype 3a HCV infection. Presented data were analyzed with the t-test. Data are showing min to max of values and + is as mean of the groups. (a) There was no significant difference in IL-23 between groups (P < 0.05). (b) This state occurred in IL-27, too (P < 0.05). From sixty four infected patients, forty four patients were infected by genotype 3a HCV and the rest were genotype 1a HCV. 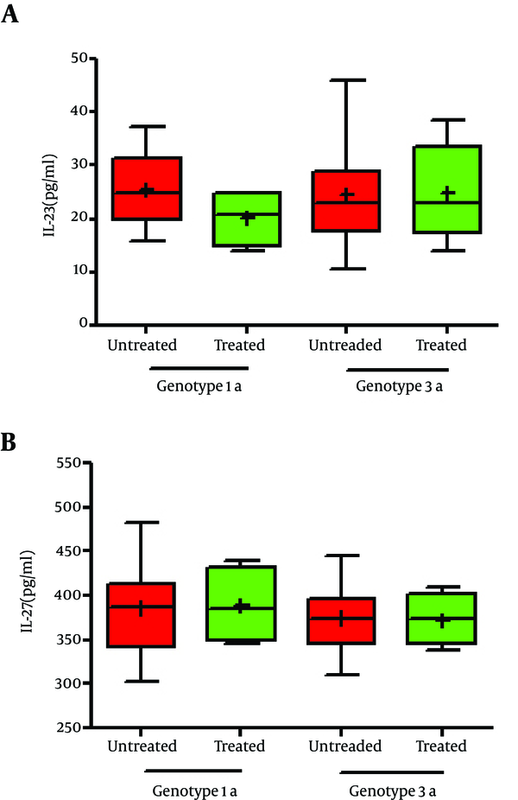 It was seen there was no significant difference in IL-23 level between genotype 1 and 3a HCV-infected- patients (25.6 ± 6.4 vs. 24.65 ± 9.7 pg/ml; P = 0.67) (Figure 2). Although the mean serum level of IL-27 in 3a HCV-infected patients were less than genotype 1 HCV-infected patients, difference was not statistically significant (374.6 ± 30 vs. 386.1 ± 51 pg/ml; P = 0.34). Moderate correlation between IL-23 level and viral load was found in 3a and 1 HCV-infected patients (r = 0.6, P = 0.001; r = 0.55, P = 0.026, respectively). In addition, there were positive moderate correlation between IL-27 level with 3a and 1 HCV-infected patients (r = 0.8, P = 0.001; r = 0.15, P = 0.02, respectively) (Figure 2). Except positive correlation found between ALT and IL-23 in 1a HCV-infected patients and 3a HCV-infected patients (r = 0.32, P = 0.003; r = -0.14 P = 0.48, respectively), no correlation was seen between serum AST, ALT and ALP level with IL-23 and IL-27 respect to genotype 3a and 1a HCV-infected patients. Positive moderate correlation was seen between viral load with IL-23 in respect to genotype 1a and 3a HCV-infected patients was found (r = 0.64, P = 0.04; r = 0.51 P = 0.03, respectively). Furthermore, positive moderate correlation was seen between viral load with IL-27 respect to genotype 1a HCV-infected patients was found and not seen in 3a patients (r = 0.72, P = 0.01; r = -0.4 P = 0.23, respectively). Table 2 demonstrates the correlation between serum markers and viral load in HCV-infected subjects with IL-23 and IL-27 based on different genotypes. a Patients were classified as group A (genotype 1a HCV-infected patients) and group B (genotype 3a HCV-infected patients). The basic purpose of this study was to find out the association of IL-23 and IL-27 with viral and laboratory factors such as viral load, genotypes and biochemical outcome. The data indicated higher level of IL-23 in patients compared to controls. However, it was not shown significant difference between 1a and 3a HCV-infected patients. 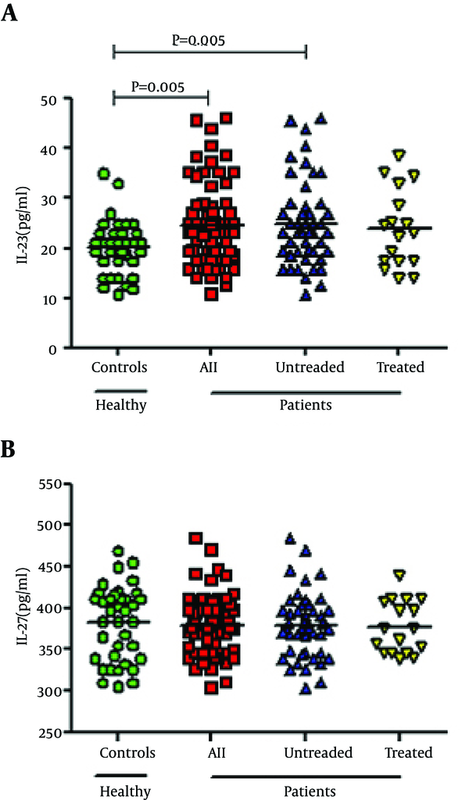 Also, serum level of IL-23 in untreated patients did not differ compared to the untreated patients, though results demonstrate higher levels of IL-23 in patients without therapy. It seems that IL-23 may be involved in hepatic necro-inflammatory responses, as previous studies show (19, 20). Hassoba et al. revealed IL-12p40 as IL-23 subunit is higher in patients with chronic HCV infection than healthy individuals that are clearer in 1a, 2 and 4 HCV-infected patients. This was confirmed by Zhang et al. in China (12, 21). The above studies imply that IL-23 is as cytokine, which can augment pathogenesis of chronicity in the infection status that is produced by activated antigen-presenting cells such as dendritic cells and macrophages. This study demonstrated a positive correlation between IL-23 with viral load in 1a and 3a HCV-infected patients, for the first time. This finding can support prominent IL-23 role in development of HCV genotypes I- and III-related chronic liver disease. Furthermore, according to difference in viral load between untreated and treated groups, it seems that IL-23 can be associated with high IL-23 expression. In addition, concomitant with previous studies, there was no significant difference in IL-23 level between HCV-infected patients with various genotypes (21, 22). IL-27 is known to be related both with development of Th1 responses and regulation of inflammatory response in monocytes/macrophages (8, 23) (24). Unlike IL-23, IL-27 showed no difference between patients (in two groups) and controls. Although IL-27 in patient groups was not different, values tended to be higher in 1a HCV-infected patients than 3a genotype. In contrast, a study demonstrated IL-12 is inhibited by HCV core protein that our findings were not revealed such results (25, 26). According to findings of Tornero and Schvoerer, enhanced IL-12 in HCV- infected patients, associate with HCV genotype 1, was reported (19, 27). Guzzo et al. indicated that co-infection of HCV with human immunodeficiency virus 1 (HIV-1) lead to significant decrease in IL-27, higher that IL-27 suppression by HIV only (28). No difference between 3a and 1a HCV-infected patients may be due to any impact of type of genotype in IL-27 immune response. Between all of the HCV-infected patients, only positive significant correlation between IL-23 levels with ALT level in 1a-infected patients was seen. Increased aminotransferases levels can be used as a predictor for disease prognosis and an indicator of liver cell injury (29, 30). Thus, a positive correlation of ALT with IL-23 in 1a-infected patients can be used as a prognostic marker for liver damage. Hassoba et al. demonstrated that increase in ALT is mostly associated with elevated IL-23 level in HCV 2-, 1a- and 4-infected genotypes that is concordant with our study (12). It seems that along with HCV infection, liver cells is influenced by immune system, continuously. Slowly liver damage leads to liver enzyme increase. On the other hand, immune response against viruses causes increased cell-mediated immunity, especially IL-12 family. As regards, IL-23, as a part of IL-12 family, can increase along viral load in order to response to virus in chronic liver disease. According this hypothesis, early treatment approaches, regards to kind of HCV genotype, can be much beneficiary for the patients; when liver cells has not been under pressure by cell-mediated immune responses. In conclusion, current study indicates that the most patients are in 3a and untreated state of disease and produce significantly high level of IL-23 but not IL-27. This finding may reflect a vigorous pro-inflammatory reaction orchestrated by the host immune system against chronic HCV. In addition to explained above, IL-23 clinically can be used as an indicator in stage of disease and a marker for prognosis and following of treatment of HCV infection. Finally, a better understanding of the underlying mechanism regulating the correlation between other genotypes with inflammatory cytokines in various stages of disease including hepatocellular carcinoma (HCC) and cirrhosis may lead to better therapeutic strategies for HCV infection. Authors’ Contributions: All authors contributed to all parts of the research. Funding/Support: This work was financially supported by a grant from by Jahrom University of Medical Sciences on June 13, 2012, Code: D.A.1754.